Your kitchen is the heart of the home, so when it comes to time to renovate be sure to talk to the team at LOOK Cabinets. Our showroom and gallery features all the latest looks and trends, products and surfaces, appliances, layouts and colours. And, one of the most sought-after kitchen styles is Farmhouse. A Farmhouse kitchen generally has a deep, over-sized sink (mounted over base cabinets), ample pantry space, plus lots of cabinets and open shelving. The cabinetry offers simple lines, accentuated with plain trims and panelling. The use of natural materials and textured surfaces are also trademarks of the true farmhouse style, which is why handcrafted and vintage accessories, exposed beams, shabby chic details, woven baskets, and upholstered furniture complete the look. The finishes for Farmhouse style cabinet hardware are generally antique looking, rugged, and often black or brown in colour to capture that aged feel. 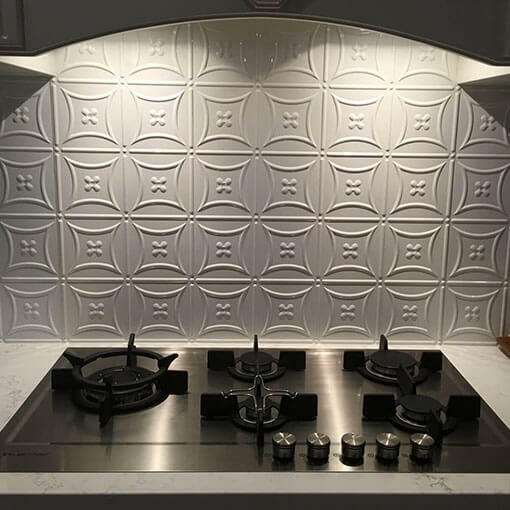 These finishes offer a gorgeous contrast against the classic white farmhouse style kitchen cabinetry. For a more contemporary Farmhouse style, Shaker style cabinet doors are very popular due to their simplistic, minimalistic look. By definition, Shaker is a 5-piece door that has a recessed centre panel, but modern techniques achieve the look much easier and more cost effective. It’s typically painted in white, off-white, beige, cream, or the softer shades of yellow, powdery blues, cool gray and lavender. JUST THINK: AIRY AND BRIGHT! Whether you choose a more traditional Farmhouse style, or contemporary edge, Farmhouse style kitchens offer a variety of gorgeous features, textures and colours to work with. When you choose a Farmhouse style kitchen, you choose a fresh, warm and inviting, de-cluttered and functional kitchen. Drop into our showroom and fall in love with a Farmhouse style kitchen today.